The mystery is solved. 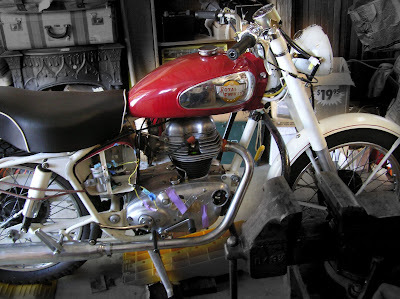 The unusual looking Royal Enfield motorcycle that appeared for sale in Rocklin, Calif. in July is the very rare Royal Enfield Hornet model, sold in the United States for one year only, 1961. Its owner Jim Luzier knew it, and he had worked on restoring it for many years, but hadn't been able explain what it was to his daughter Aimee, who placed the ad. I wrote about the motorcycle, noting that, while it resembled the 250cc Royal Enfield Crusader, it had a slim rear fender not seen on U.S. Crusaders. I guessed it might have been a transition model, intended to use up parts Royal Enfield made for the motorcycles they provided the Indian motorcycle company for sale in the U.S. as Indians. 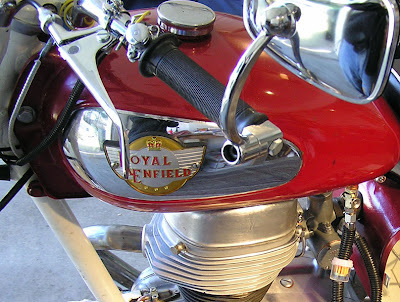 The deal with Indian ended in 1959 and Royal Enfields were sold under their own name after that. With help from Aimee, U.S. Royal Enfield blogger Jorge Pullin and a Hornet owner named Nate, I guessed the pretty little motorcycle must be a Royal Enfield Hornet, although I'd never even seen a good picture of one. Jorge found the drawing shown above. 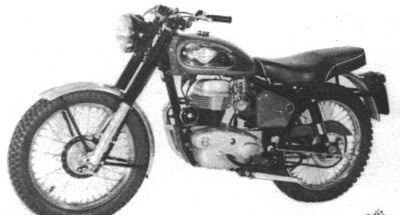 The Hornet was the equivalent of a Crusader Sports, but had parts mixed in from the earlier Indian Hounds Arrow, a trail bike. Sadly, Jim Luzier died July 15, of an apparent heart attack. Aimee performed CPR until paramedics arrived, but could not save him. Before he died, though, Jim Luzier left the answer to the question where Aimee could find it. In 2008, in what Aimee says was a playful mood, Jim posed for a picture for a friend in England named Alun. 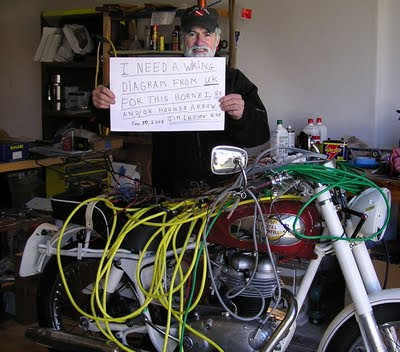 Jim is shown in the picture holding up a sign that reads: "I need a wiring diagram from UK for this Hornet RE and/or a (Indian) Hounds Arrow. Jan. 20, 2008. Jim Luzier, USA." As part of the joke, the motorcycle was festooned with extension cords from Jim's shop; it sure did look like he had a wiring problem! 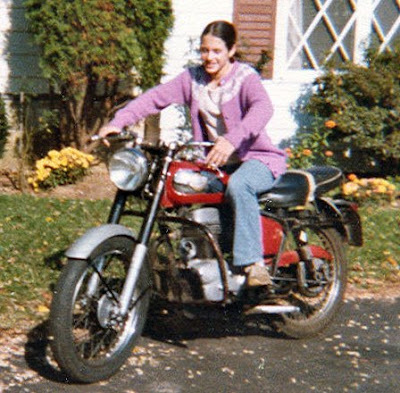 Aimee also found a 1977 picture that showed her on the motorcycle, before restoration began. It shows the black frame, Chinese red tank and alloy fenders a Hornet would have. "Dad decided to paint most of the frame white for visibility when he was restoring it," she explains. The little Hornet's immediate future is unclear. Aimee is leaving the U.S. for Norway, for a position as a teacher at the Red Cross Nordic United World College. "I may have to just put the bike in storage until I return in two years, although I will be looking for a new owner who can lavish the same kind of love on it that my Dad did... I do have a lot of material (maintenance, wiring diagrams, paint, etc.) that Dad used in restoring the bike... I will hold onto it until I find the right person," Aimee writes. She signed herself "Aimee Luzier - daughter of James E. Luzier 1934-2009." This is such a sweet and satisfying story. I love how much this man cared about his motorcycle. And I love how much his daughter now cares about it. I enjoyed how the RE community helped solve the mystery, too. It seems so many of these machines have wonderful stories behind them. I'm very, very sad to learn of Jim's passing. We became acquainted through the Hitchcocks Motorycles website from early in 2008. Jim had made a beautiful job of the restoration but couldn't fire it up. We spent months going over every aspect of the set-up from carburettor jets to auto-advance, valve timing and points gap. Nothing seemed to work, despite tests proving there was a spark at the plug and fuel in the carb. Jim sent me dozens of photos and we checked everything; I pored over the books, dismantled my own bikes, took more photos and wrote emails giving hopeful instructions. We came to the conclusion that the bike was a Hounds Arrow with modifications and, although we could never get it to run properly we did get some signs of life eventually and I like to think we became good friends during the attempt! When we began Jim lived in Scapoose, Oregon, and I had hoped to visit him there as I have family nearby. In the event, Jim and Aimee moved to Rocklin and we never actually met. I last heard from Jim in Feb 2008. He had got the bike to run, but only at full throttle. He took great delight in the noise and smoke thus created, but still couldn't get it to idle. I really hope Aimee can find a good home for the bike as Jim spent so much time and effort on it, even though he did threaten to set fire to once or twice! Jim was a gentleman. We are all the poorer for his passing. Sorry for my error, I last heard from Jim in Feb 2009, not 2008. I now think the bike is, most likely, a Hornet, but, at the time, I thought it was built before the Hornet was available. The cylinder head has a single screw in the pushrod tunnel (later engines have 2) and the frame number is 16573. Alun, thank you for your comments. The information you provided here will serve as a lasting tribute to Jim's restoration effort! I guess she's probably overseas right now and had I seen this afore now would have suggested letting bluemooncycle in Norcross Georgia put it in their museum until she returned. People would be able to view it there and I think her Father would have enjoyed that thought. The frame number quoted above identifies this machine as a 1960 Hounds Arrow according the Redditch factory dispatch ledgers. Copies of USA sales literature I have been sent would seem to indicate that it is Crusader Sports Scambler as per the '60 leaflet. The Hornet is shown a year later in the '61 leaflet, but does look identical. These two model names do not appear in the factory ledgers, however, being USA "dealer specific". If anyone can provide me with the engine number, including prefix letter(s), I would be most grateful.